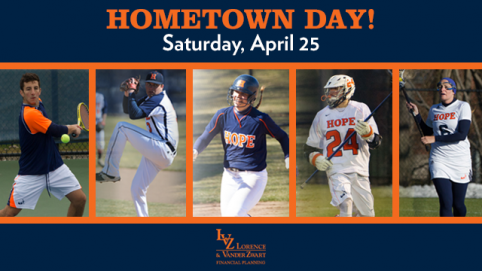 Hope College Athletics will celebrate Hometown Day this Saturday with five home sporting events on campus and special giveaways. Lorence & VanderZwart is sponsoring Hometown Days. At 10 a.m., the Hope men's tennis team plays Calvin at Etheridge Tennis Complex. It is the annual Pink Out match that honors for former Hope women's tennis coach Karen Page, who died in 2009. At 1 p.m., Hope's baseball team will host a MIAA doubleheader against Alma at Boeve Stadium, while the Flying Dutch softball team welcomes for a MIAA doubleheader at Wolters Stadium. Also, at 1 p.m., the Flying Dutchmen lacrosse team faces Calvin at Van Andel Stadium. At 4 p.m, the Hope women's lacrosse team hosts Albion for a MIAA match at Van Andel Stadium. As part of Hometown Day, there will be team poster giveaways for baseball, men's lacrosse and women's lacrosse while supplies last. Lacrosse players will be available after both matches to sign autographs. There will be no autograph session for baseball. Also, fans can receive free hot dogs and popcorn at all four sporting events while supplies last. Hope College senior nursing major Claire Stinson of Overland Park, Kansas, has been honored for her research project conducted in collaboration with Holland Hospital aimed at improving the emergency room experience for both patients and staff. The Holland-Hope College Sustainability Institute has launched a new website designed to help members of the community interested in making a difference both at home and by connecting with others interested in doing the same.